Lacking a bona fide playoff system, college football fans are left to wonder each year which time is the best. But there’s no doubt about this list — the SportsLifer’s top 10 college football teams of all time. We used several simple criteria in the selection process. Teams had to finish undefeated, untied and undisputed national champions to quality for the SLTop10. And the quota is one champion per school. Quite simply, the most dominant team in college football history. The 1995 Cornhuskers, coming off an unbeaten 1994 campaign, averaged 50 plus points a game, and defeated four teams ranked in the Top 10. The Tom Osborne-coached Huskers won every one of those games by no less than 23 points. Big Red averaged 53 points a game, and gave up 14 per game. Do the math, that’s a margin of victory of 39 points a game. Nebraska trailed for one quarter all season, and handed Florida its only loss of the season, 62-24, in the Fiesta Bowl for the National Championship. Talented? A total of 27 future pros played for Nebraska in 1995. Some Big Red fans and experts might argue the 1971 team was better, but for sheer gridiron dominance, the 1995 squad stands peerless in the history of college football. The 1994 Nebraska team was pretty good too. Both the ’71 and ’94 squads finished 13-0 and capped off championship seasons with Orange Bowl victories. The USC team of 1972 is generally considered the best football team in Trojan history. They went undefeated and beat Ohio State, 42-17, in the Rose Bowl. Led by Coach John McKay and Fullback Sam “Bam” Cunningham, USC plowed through the competition in 1972 with ease, defeating six ranked teams. Only Stanford came within 10 points of the Trojans all year. USC’s offense averaged 39 points a game, and their opponents averaged 10. How good was Southern Cal in 1972? They were the first team to ever receive every single first place vote in every single poll. The 2004 Trojans, who went 13-0 and won the BCS with a 55-19 thrashing of Oklahoma in the Orange Bowl, also deserve mention. Miami was dominant on both sides of the ball in 2001, scoring 512 points and surrendering only 117 during the year. The Hurricanes capped off a perfect season by beating Nebraska, 37-14, in the Rose Bowl for the BCS championship. Miami’s margin of victory was greater against ranked teams than against unranked opponents. The Miami defense allowed 13 touchdowns and Miami also scored 11 non-offensive touchdowns. And the Hurricanes may have been the most talented college football team ever — at least six players on the 2001 roster went on to play in the NFL Pro Bowl. The most celebrated team in Notre Dame’s glorious history, the Irish finished 10-0 — and eight of those opponents had winning records. Notre Dame beat Stanford, 27-10, in the Rose Bowl, the school’s only bowl appearance until the 1970 Cotton Bowl. The hero of the 1925 Rose Bowl was fullback Elmer Layden who scored the first touchdown of the game and later returned passes of Stanford All-American back Ernie Nevers 78 and 70 yards for scores. Coach Knute Rockne’s 1924 Irish were led by the heralded Four Horsemen — quarterback Harry Stuhldreher, halfback Don Miller, halfback Jim Crowley and Layden – -and anchored by the Seven Mules on the line. The 1949 Notre Dame team which finished 10-0 and won the national championship under coach Frank Leahy was also considered. This Oklahoma team was in the midst of their still-standing NCAA record 47-game win streak, and though conference rules in that time prohibited teams from participating in Bowl games in back to back seasons, OU did not need a bowl game to be crowned NCAA champion. The 1956 Sooners averaged 46 points a game, and held their opponents to 51 points on the season. The Sooners were coming off an 11-0 season in 1955, when they were crowned national champions. This was legendary coach Bud Wilkinson at his best. The Sooners were led by halfback Tommy Mc Donald, who ran for 14 TDs, caught four and even passed for three in 1956. 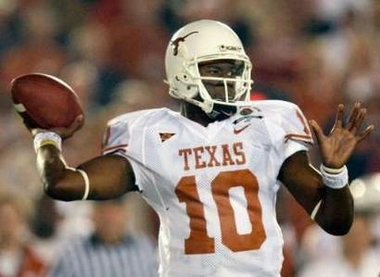 The 2005 Texas Longhorns scored 652 points in 13 games while holding their opponents to 213 points. With Vince Young at quarterback, they beat previously unbeaten and defending champion Southern California, 41-38, in a thrilling BCS title game in the Rose Bowl to finish with a perfect season and a national title. In 1969 Texas finished 11-0 and beat #2 Arkansasa, 15-14, and then Notre Dame, 21-17, in the Cotton Bowl. The 1968 Ohio State team produced 11 All-Americans and six first round draft picks. The Buckeyes won the Big Ten title and then topped unbeaten and once-tied USC, 27-16, in the Rose Bowl. Afterwards USC All-America running back OJ Simpson told the Buckeyes: “You’re the greatest team in the country and don’t let anybody tell you what you aren’t.” In 1968, Ohio State began a string of three straight seasons and nine in 10 in which it won or shared the Big 10 title. One of Bear Bryant’s last teams, the Crimson Tide finished 12-0 and beat Arkansas 24-9 in the Sugar Bowl. Alabama posted five shutouts, and won seven of 12 games by three touchdowns or more. The Tide ranked first in scoring defense, second in total and passing defense and fifth in rushing defense. The Wolverines, in their second year under head coach Fielding H. Yost, finished the season 11-0 and outscored the opposition 644 to 12, averaging 58.6 points per game. The 1901 Michigan squad was unbeaten, untied and unscored upon (555 to 0), but shared the national championship with Harvard. In 1948, the Wolverines finished 9-0 and was voted #1 in the nation. The Polo Grounds: Been there, done that. 9. I remember goalies without masks and canvas Cons. Notre Dame and Army will attempt to “wake up the echoes” Saturday when they renew their historic college football rivalry at Yankee Stadium. The Fighting Irish and the Black Knights no longer dominate American sports. And they’ll be playing at the new Yankee Stadium, not the original Stadium that was the site for 22 meetings between 1925 and 1969. But the 50th meeting between Notre Dame and Army is hardly your garden variety regular season game either. The game and the venue hark back to an era –from the Roaring ’20s to post World War II — when the Notre Dame-Army game captivated the nation. 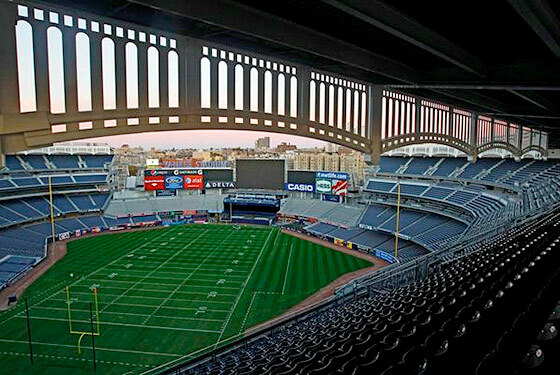 The Irish and Cadets staged their first Yankee Stadium meeting in 1925, a game Army dominated, 27-0. Three years later at the Stadium, the teams were tied 0-0 at the half when Notre Dame’s legendary coach Knute Rockne inspired his charges with the most famous halftime speech in football history. That day Rockne invoked the words of George Gipp, one of the great players in ND history who died of strep-throat infection in 1920 at the age of 25. Notre Dame dominated the series at Yankee Stadium from then through the mid ‘40s, winning 12 times and tying twice in 15 games. Army, which was ranked #1 in the polls and finished unbeaten, turned the tables on Notre Dame in 1944 and 1945, whipping Notre Dame 59-0 and then 48-0 at Yankee Stadium. That set up one of the most famous college football games in history in 1946, #1 Army vs. #2 ND, aka The Game of the Century. Despite predictions of a high scoring game, the two powers played to a scoreless tie before 74,121 at the Stadium. The win ended Army’s 26-game winning streak and the Irish won the national championship when they beat USC 26-6 on the final weekend of the season, while Army edged Navy 21-18. The 1946 Notre Dame-Army game featured four Heisman Trophy winners in uniform Do c Blanchard (1945) and Glenn Davis (1946) of Army and Johnny Lujack (1947) and Leon Hart (1949) of Notre Dame) and 12 members of the College Football Hall of Fame. After meeting every year since 1919, Army decided to end the annual series following the 1947 season because they felt it was becoming too one-sided in favor of the Irish. The game was played in South Bend for the first time and the Irish won, 27-7. Through the decades the teams have met infrequently, with Army’s last win coming in 1958. Most of the games have been contested at neutral sites, such as Ebbets Field in Brooklyn, the Polo Grounds and Shea Stadium in New York, Soldier Field in Chicago, Philadelphia’s JFK Memorial Stadium and Giants Stadium in New Jersey. Notre Dame leads the series 37-8-4. Extra Points: The first Notre Dame-Army matchup in 1913 is generally regarded as the game that put the Irish on the college football map. In that game, Notre Dame revolutionized the forward pass in a stunning 35-13 victory on the Plain at West Point. Irish quarterback Gus Dorias passed for 242 yards that day, including a 25-yard touchdown pass to a young end by the name of Knute Rockne. The 1924 game at the Polo Grounds provided the setting for the most celebrated lead in the history of sportswriting. Notre Dame and Army met most recently in 2006, when the Irish pounded the Black Knights 41-9 at Notre Dame Stadium. Can You Do Better Than Best of The Best? 1. Name me a better football player than Jim Brown? 2. Name me a better baseball player than Babe Ruth? 3. Name me a better basketball player than Michael Jordan? 4. Name me a better hockey player than Wayne Gretzky? What a week for the Giants. First the San Francisco Baseball entry wins its first World Series in 56 years….and the first ever for the City by the Bay. Then the New York Football Giants play perhaps the greatest first half in their 85-year history, taking a 35-0 lead against the Seattle Seahawks. Three touchdown passes from Eli Manning and a pair of touchdown runs by Ahmad Bradshaw led the way in an eventual 41-7 win. The 35-0 halftime lead was the largest the Giants have enjoyed since 1959, when three TD passes by Charlie Conerly, two to Bob Schnelker, and a fourth by Frank Gifford gave Big Blue a 38-0 lead over the Washington Redskins. The Giants eventually won that game, 45-14, at Yankee Stadium. The Giants finished 10-2 that year before losing to the Colts in the NFL championship game for the second year in a row. The glass has been half full before for the Giants. In 1963, already saddled with two losses, the Giants marched into Cleveland, caused an early Jim Brown fumble, and rumbled to a 23-0 halftime lead over the unbeaten Browns. The Giants won 33-6 holding Brown to a mere 40 yards rushing and even blocking the extra point after Cleveland scored late in the game. That Giants team won the Eastern Conference before losing to the Chicago Bears in the NFL title game at Wrigley Field. And in the 2000 NFC championship game, Kerry Collins threw four of his five touchdown passes in the first half, two to Ike Hilliard, and the Giants took a 34-0 lead into the locker room. The final 41-0 shutout win remains the largest shutout in NFC championship game history. The Giants went to the Super Bowl that year but were trounced by the Baltimore Ravens. I have a confession to make. The SportsLifer is a closet San Francisco Giants fan. There, it’s out. And I’m not just saying that either. When I was in fifth grade, my family moved from the suburbs of New York to Daly City, California, outside of San Francisco. We knew the move was temporary. My father, an engineer, was assigned to install a data processing system at a Planter’s Peanuts packaging facility off highway 101, not far from Candlestick Park. The year was 1962, and the Giants were in a fierce pennant race with their arch-rivals, the Los Angeles Dodgers. The Giants and Dodgers, of course, had left New York for the West Coast five years earlier. Now I admit I’ve always been a Yankee fan, and was rooting for the Yanks to win that October afternoon at Candlestick Park. But I followed the Giants throughout that 1962 season, and through the years have watched them from afar, silently hoping they would one day win a championship for the beautiful city of San Francisco and for devote Giants fans everywhere. Tony Bennett would say that I left my heart in San Francisco. I suppose I first got hooked on the Giants when my father took me to a game at windy Candlestick back in 1962. That day I saw Willie Mays hit a grand slam and Juan Marichal defeat the Cubs. In later years, I saw the Giants earn an Opening Day win at Candlestick against the defending NL champion Padres in 1985, and beat the Dodgers on a chilly May evening several years later. And I’ve been to the new home of the Giants twice — PacBell, SBC, AT&T, whatever — and saw two historic milestones, Barry Bonds 500th career stolen base in 2003 (still the only player to hit 500 home runs and steal 500 bases) and Bonds 756th home run that broke Hank Aaron’s record in 2007. I even saw Bonds hit a titanic three-run homer into the far reaches of the upper deck at Yankee Stadium in 2002. And watched Will Clark belt a pair of home runs as the Giants beat the Braves 23-8 at the old Fulton County Stadium in Atlanta. Some of my best friends are Giants fans, including Mike, the winemaker, Glenn, a PR colleague, and Vince, a high school buddy. Heck I’m a huge fan of the New York Football Giants. That counts for something. Oh yeah, almost forgot. I saw the Mets play in one of the original homes of the Giants, the Polo Grounds in New York, back in 1963. Bet I am one of the faithful few left who have seen three of the Giants home ballparks — the Polo Grounds, Candlestick and AT&T Park. Add it all up, I qualify as a Giants fan. Way to go Giants. Wish I could have been there on Market Street for the parade. 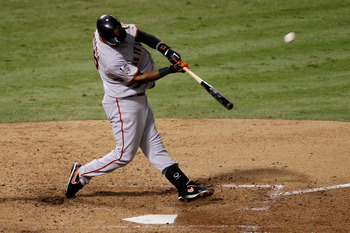 Edgar Renteria homers to give Giants a 3-1 win and a World Championship. Edgar Renteria joined some mighty select company. His three-run home run off Texas Rangers’ ace Cliff Lee in the seventh inning snapped a scoreless tie and gave the Giants the runs they would need to win their first World Series since moving to San Francisco in 1958 — and their first title since the New York Giants swept the Cleveland Indians in 1954. The Colombian-born shortstop became just the fourth player in baseball history to have the game-winning RBI in two different World Series, joining Yankee immortals Lou Gehrig (1928, 1936), Joe DiMaggio (1939, 1949) and Yogi Berra (1950, 1956). Wait, there’s more. Of that august quartet, Renteria is the only player to have a walk-off hit among his game-winners. Exactly 4,755 days earlier, in 1997, he lined a single up the middle to knock in the winning run in the 11th inning of the seventh game. Renteria was just 21 years old then, and his clutch hit led the Florida Marlins to their first World Championship with a 3-2 win over the Indians at Pro Player Park. Renteria also made the final out of the 2004 World Series when he grounded back to the box, giving the Red Sox a 3-0 win over the St. Louis Cardinals and their first World Championship in 86 years. The Giants took a 2-1 lead in the top of the 10th inning, and seemed to have a championship well in hand with the great Christy Mathewson on the mound. But Giants center fielder Fred Snodgrass dropped a routine fly ball to start the home half of the 10th, and Larry Gardner later hit a deep sacrifice fly to Josh Devore in right, scoring Steve Yerkes with the winning run. 1924 Senators 4, over Giants 2 (12 innings) at Griffith Stadium, Washington, D.C. The Senators rallied to tie the score with a pair of runs in the eighth, aided by a fielding error by the Giants 18-year-old third baseman Freddie Lindstrom. The stalemate continued until the 12th thanks to flawless, four-inning relief pitching from Washington immortal Walter Johnson. In that inning, the Giants committed two major fielding errors including a replay of the missed grounder to third and a dropped foul by catcher Hank Gowdy, who tripped over his own mask. The winning run scored when the Nats Earl McNeely hit a grounder that took a bad hop and bounced over the head of Giants third baseman Fred Lindstrom, scoring Muddy Ruel and giving Washington its first, last and only World Championship. One of the most renowned teams in baseball history, the 1927 Yankees, looking for a sweep and tied with the Pirates 3-3, loaded the bases with nobody out in the bottom of ninth. Pittsburgh relief pitcher John Miljus then struck out Lou Gehrig and Bob Meusel, but threw a wild pitch to Tony Lazzeri, scoring Earle Combs and ending the game. The Yankees had won their second championship title, the crowning achievement to a magnificent season. They also became the first team ever to sweep the National League in a World Series. Facing the Chicago Cubs, the A’s trailed Game 5 before a two-run homer by Mule Haas over the right field wall tied the score 2-2 with one out in the ninth. Max Bishop then singled and with outs, following an intentional walk to Jimmie Foxx, Bing Miller doubled off the Shibe Park scoreboard to plate the winning run. It was Philadelphia’s first title since 1913, while Chicago, which lost an 8-0 lead in Game 4 before bowing 10-8, lost a heartbreaker. It was a sad portent of things to come for the Cubbies. With the score tied 3-3, the Cubs stranded Stan Hack on third base with nobody out in the top of the ninth. Detroit catcher Mickey Cochrane led off the bottom of the ninth with a single, and scored the winning run two outs later on Goose Goslin’s base hit to right field. Detroit won its first World Series, while the Cubs continued their championship drought, which has now reached 102 years. Yankee second baseman Billy Martin, who had 12 hits and 8 RBIs while batting .500 in the series, knocked in Hank Bauer from second base with the game-winning run in the ninth inning to give the Bombers a record fifth straight World Championship. Brooklyn had rallied to tie the score in the top of the ninth on a two-run home run by Carl Furillo. With one of the most famous home runs in baseball history, Pittsburgh second baseman Bill Mazeroski vanquished the heavily-favored Yankees, who outscored the Pirates 55-27 in the seven-game series. The Yanks scored two runs in the top of the ninth to tie the score at 9-9 before Maz led off the home half of the ninth. With a 1-0 count against New York reliever Ralph Terry, Mazeroski smashed his historic home run over the wall in left field to end the contest and give the Pirates their first championship in 35 years. Game 7 matched Detroit native John Smoltz of Atlanta a gainst his hometown hero and former Tiger Jack Morris, now Minnesota’s ace. Both the Twins and Braves blew chances to score in the late innings, and the two clubs battled scoreless into the bottom of the 10th. 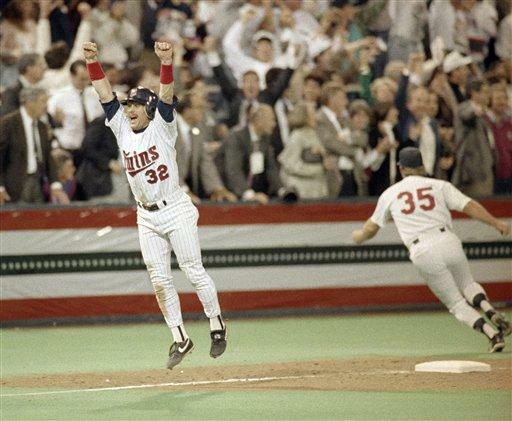 Dan Gladden, right, opened the Twins half of the inning with a double, was sacrificed to third, and after a pair of intentional walks pinch-hitter Gene Larkin singled to give Minnesota and Morris, who went the distance, the championship. Cleveland, seeking its first title in 49 years, took a 2-1 lead into the last of the ninth before the Marlins rallied to tie the score. 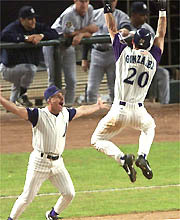 In the 11th, Edgar Rentereia’s two-out single drove in Craig Counsell with the winning run. The celebration in Florida was short-lived; the Marlins roster was broken up and the following season the team finished 54-108. The Yankees, seeking their fourth straight World Championship, took a 2-1 lead into the last of the ninth with closer Mariano Rivera on the mound. Rivera had converted 23 straight postseason saves and had struck out the side in the eighth. However the Diamondbacks rallied, tying the score on a double by Tony Womack and then winning the Series when Luis Gonzalez, above left, connected for a shallow looping single to center that just cleared the infield and scored Jay Bell with the decisive run.